It’s National Coming Out Day! And just for the record, in case it isn’t clear: I’m queer! Specifically I am a gay man married to a bisexual man. For many years I lived in the closet, and am almost indescribably happy that those days are over. So, if you’re a person living in the closet, I urge you to consider coming out. Coming out is scary. And I know that not everyone is safe to come out—a frightening number of parents throw their children out if they even suspect they are gay (not to mention the cases where parents have murdered their kids they thought were gay). 40% of homeless teen-agers are living on the streets because their parents either kicked them out because the teens were gay (or suspected of being gay), or drove them away through the constant abuse intended to beat the gay out of their kids. This statistic is the main reason I advise kids not to come out until they are no longer financially dependent on their parents. Yeah, there are many stories of kids who came out to their parents and those parents became supportive allies. But not all, by any means. Being in the closet isn’t just an inconvenience. Studies show that being closeted adversely affects your physical health. You live in a constant state of high anxiety about people finding out and what they might do when it happens. This affects us the same as extended trauma, inducing the same sorts of stress changes to the central nervous system as PTSD. And coming out isn’t a one and done thing. People will continue to assume you’re straight. You’ll find yourself coming out again and again. But the thing is, being out is so much better than being in that closet. You will be amazed, as you process the aftermath, at how much energy you were expending worrying about people finding out. You will be surprised at the sheer weight of the stress you were dealing with being closeted. Like me, you may discover that a lot of health issues were fueled by that stress, and they get a lot better once you’re no longer hiding, deflecting, thinking of plausible lies, and constantly dreading someone finding out. I wish we lived in a world where fear of being who we are wasn’t so real. But one of the small ways we can make the world a little less scary for queer people is to come out. As a teenager, the one time I saw a gay couple on a news program being interviewed about the gay rights struggle probably saved my life. There were two men admitting they were gay—two men who had been in a committed relationship for years and seemed happy. It was a ray of hope I desperately needed. And that’s one of the reasons I am out. 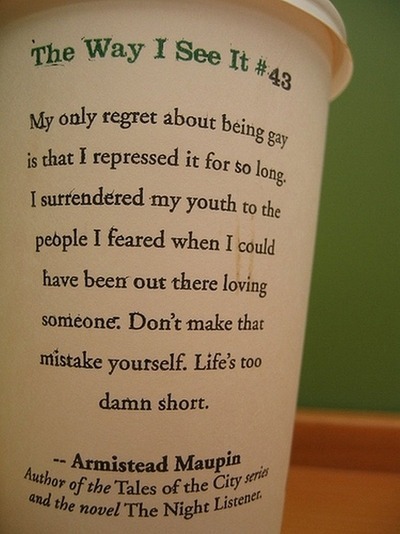 It’s why I mention my queerness as often as I do. So that some frightened queer kid might see that, look, there’s a gay man who is happy, has a good life, has people who love him, has friends—gay, straight and otherwise—who have his back. So, maybe, we can be a glimmer of hope for them. 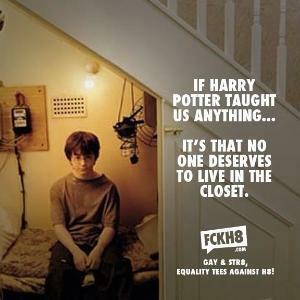 No one deserves the closet. No one deserves that fear and self-loathing. When you’re ready, come out. It really is a wonderful world outside of that closet.